There is really only one prayer that a non-Christian can pray with the assurance that God will hear him. It is the prayer for mercy—from a humble heart that sincerely has decided to go God’s way. Any other prayers that are uttered by a non-Christian are an abomination to God and are not heard. Why? Well, it is not because God is not good. He is good (Read Matthew 5:43-45). It is because He can not grant any other request of the unsaved, because they naturally do not do what is right or seek after God (Romans 3:10-11). Isaiah 64:6 tells us that the unsaved are unclean and all their righteousness are like filthy rags to God. Therefore, God will not listen to their prayers because all their requests are made with selfish, ungodly motives. Well, what does the Bible say? In Romans 3:23 it says, “For all have sinned and fall short of the glory of God.” It also says in 1 John 3:8, “He who sins [the non-Christian] is of the devil, for the devil has sinned from the beginning.” And in Matthew 13:19 and in Ephesians 6:16 the devil is called the wicked one. Therefore, because all non-Christians are of the devil, the wicked one, we must conclude that they are wicked. And so, God does not hear (listen to) their prayers. But let’s go back to Proverbs 15:29. The last part of the verse says, “…But He hears the prayers of the righteous.” We have said that God will not hear the prayers of the non-Christian because of his sins. But here the writer of Proverbs tells us that He hears the prayer of the righteous, those who have been saved from their sins. So what must the unbeliever do to be saved? There is only one thing he can do. He must pray the only prayer that God will hear, the prayer for His mercy—mercy that will forgive him of his sins and make him clean and righteous. Yes, God put all of our sins on His Son; He died and paid the penalty for all our sins. Our response must be to believe in Him and to cry out for His mercy. 2. Am I repentant of my sins; that is, am I willing now to give up my sinful ways and to go God’s way? 3. Do I believe in God and His Word? Do I believe that He died on the cross for my sins? Do I believe that He will hear and answer my prayer for mercy? If you said yes to all of those things, you are ready. Now is the time to cry out to God for His mercy. In your prayer to Him you must admit your sins, repent of your sins, and believe in Jesus to save you. Ask Him now to come into your life. The Bible says He stands at the door of your heart (or of your life) and He is knocking. He wants to come into your life to save you from the ultimate penalty of sin—hell. And He wants to make you a new person. He says to all unbelievers, including you, “Behold, I stand at the door and knock. If anyone hears My voice and opens the door, I will come in to him and dine with him, and he with Me” (Revelation 3:20). Do you sense that Jesus wants to come into your life? Do you feel that God is calling out to you, that He wants to save you from hell, and that He want you to be His follower? Lord Jesus, I am praying to You now because I know I am a sinner and I need Your forgiveness. I believe You died on the cross for my sins and paid the penalty for my sins. Please come into my life and forgive me of my sins. Make me a new person and show me how to live as You would want me to live. Amen. 2. You have been adopted into God’s family together with all believers (John 1:12). As His children we stand in His grace (Romans 5:2) and we enjoy the privilege of talking to Him and requesting from Him anything we need (Read Romans 8:15-16). 3. God has given you many precious promises you can claim and enjoy through prayer at any time. Here are nine wonderful promises: (1) Assurance of Salvation, John 5:24; (2) Assurance of Forgiveness, 1 John 1:9; (3) His Guidance, Proverbs 3:5-6; (4) His Provision, Matthew 6:33; (5) Victory over Temptation, 1 Corinthians 10:13; (6) Peace of Mind, Isaiah 26:3; (7) His Help in Trouble, Psalms 34:4; (8) His Strength, Isaiah 40:31; and (9) Answered Prayer, John 15:7. 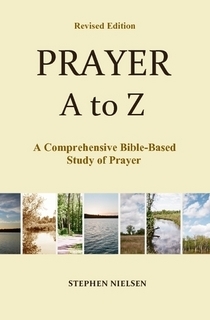 This entry was posted in Answers to Prayer, Prayer A to Z Excerpts and tagged 1 John 3:8, 1 Peter 2:24, christian, Isaiah 53:6, Isaiah 64:6, John 9:31, Proverbs 15:29, Revelation 3:20, Romans 3:10-11, Romans 3:23. Bookmark the permalink.